Oh Why Can’t I have Straight Hair? That’s the question I asked myself more times than I can count. I’ve been on a journey that could seem superficial at first glance. I’ve spent my life envying women for having lovely straight hair. I was born with curls, but not Shirley Temple curls. They’re more like a frizzy, sticking up in the wrong spots type of curls. I wanted straight hair like the pretty girls had. You know the ones, the girls who look like they have it all together. Maybe if I had hair like them, then my life would be neater, straighter, less messy. But no matter how many times I’d straighten my hair, there was always a part that wouldn’t behave. A part that wouldn’t take part in the charade I was a straight-haired girl. It never occurred to me I could love my hair the way God created it. I never saw my curls as lovely or good. They were an embarrassment, and that made me one too. Such a silly thing, isn’t it? Hair? Why should I care about it? I’ve asked myself the same question repeatedly. The past three years of my life have been ripe with discovery. Discovery of who I am in Christ. A discovery of how I am made. A discovery of how I can and should interact with others. One thing I’ve been working on is accepting my hair the way God created it: a myriad of curls atop my head. If I want to be an authentic and transparent follower of Christ then why spend hours trying to force my hair into shapes it doesn’t want to take? On the surface, it’s just hair. Not a big deal. But underneath, it’s more than hair. It’s representative of how I’ve seen myself. I wanted the world to accept and love me. I wanted people to see good in me. When rejection came, I felt devastated. My worth was wrapped up in the whims of others. I gave the power of my joy away to others. Others who didn’t even know the power they wielded in my life… and it bred bitterness and discord in my heart. 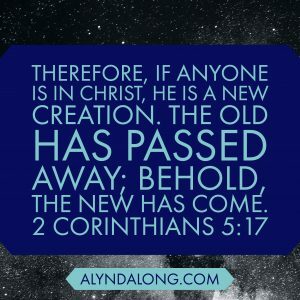 Like anyone who has accepted Jesus Christ as her (or his) savior, I am a new creation in Him. 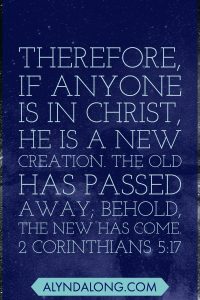 2 Corinthians 5:17 tells us, “Therefore, if anyone is in Christ, he is a new creation. The old has passed away; behold, the new has come.” Being a new creation in Christ shows me where my value lies. If I am looking to Him for my value, then I ALWAYS know where I stand. I always know I am loved and cherished. I’m not at the whim of another fallible human being. Do you have experiences with feeling less than others? 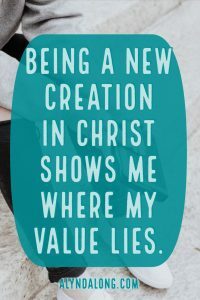 Have you also put your worth in how the world views you instead of remembering you are a new creation in Christ? How may I encourage you today? Motherhood Is Hard, but God's in the Mess! Great word of encouragement! Many of us–probablt most of us–are like you. Our self worth is based on what others think instead of what God thinks. 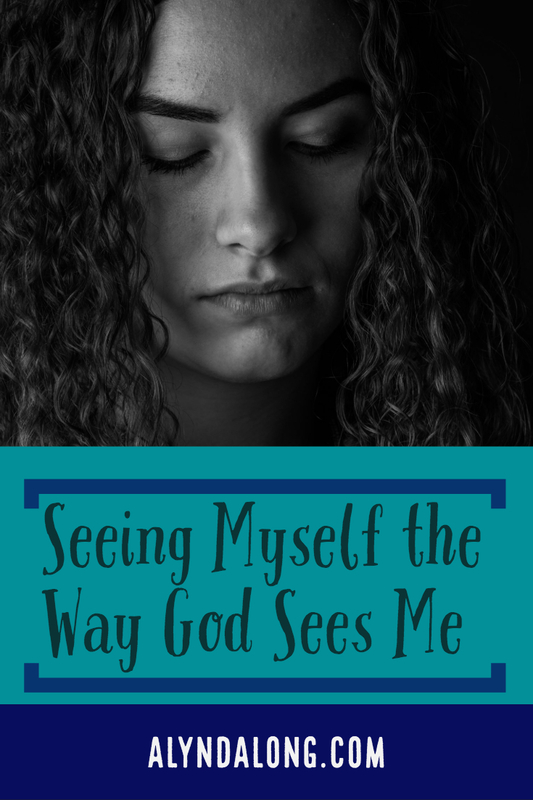 There is so much freedom when we can see ourselves as God sees us! Thanks so much, Norma! You are so right about the freedom. It’s like going from seeing the world in black and white to full color. Everything is brighter and bolder! Blessings to you! Melissa, I’m so glad your husband is an encourager! Thank you for sharing your story with me. It’s a great reminder to be thankful for what we have. Joy isn’t defined by our circumstances or situations, but through the Lord and the gifts He gives. I’m so glad you “beat” cancer! Blessings to you! I totally get this. I have curly hair and I have not (sometimes still don’t some days) like my hair. I have totally had hair envy of others with straight hair. It has always been more than just about my hair. I have always been a little different and my hair was something that showed it on the outside. It has taken time to learn to love who God made me to be and even my crazy hair. Sara, thank you so much for your encouraging and thoughtful words! Amen! He does love us and we can capture our negative thoughts and replace them with God’s truth! Blessings to you! Hi Alynda, as a curly girl….this article so resonates with me! I wish I read this 25 years ago when I almost burned off all my hair with chemical relaxers! Thanks for writing this.